Elena Anosova spent her teenage years in a Russian boarding school and found it a formative experience. “It was a sheltered institution with its own hierarchy and rules,” she says of the memory. A universe of its own, with no private space or security and with its own social norms. And it was growing up in this environment that made Elena interested in closed all-female microcosms, which is how she arrived at female prison colonies. Russia has a long history of using both female and male prisoners for free labour. Today these “corrective colonies” are direct descendants of the Gulag labor camps of the 1930s, and have become the most common type of prison throughout Russia’s current and former territories. Such colonies usually combine low-skill manufacturing and labour with penal detention. 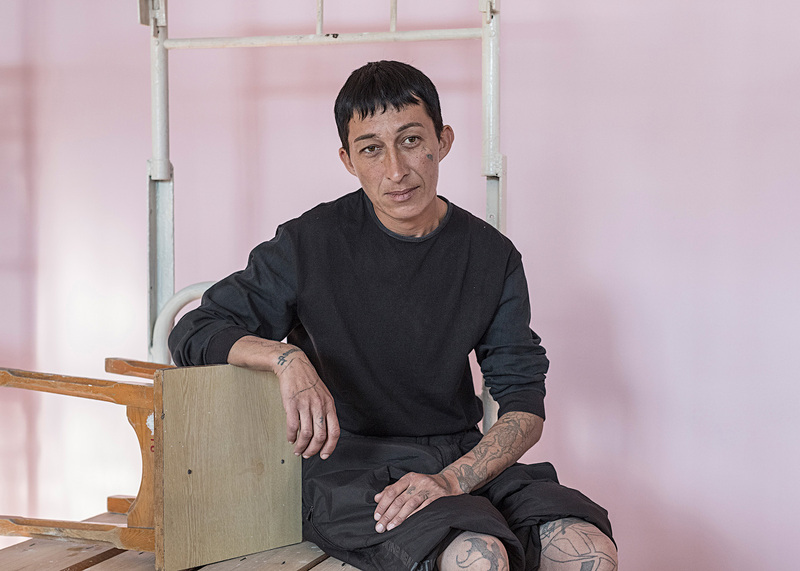 Photographer and artist Elena Anosova got access to some of these women’s colonies and photographed their inmates. Here she talks about what she saw, and how Russia’s patriarchal society places so many women in prison. VICE: Hey Elena, so I understand you originally set out to photograph boarding schools, similar to the one you attended. Why did you switch to prisons? Elena Anosova: Well times have changed and with the internet and everything boarding schools have become different places, much better than they were in the 90s when I was there. So I needed something else. And I decided the next best thing would be to shoot a prison. How did you get access to these places? It took just eight months to get the permission and a lot of people helped, friends and their friends and their parents. Also, the administration realised I’m not a journalist and that helped a lot. I first got access in August 2014, although I’m still working on parts of it. What does a women’s prison in Russia look like? Quite often, a colony is the only place to work in small remote villages. A colony for 900 prisoners could be in a village of only 400 people. The staff I photographed were usually young men and women who’d returned to their villages from the big cities to take care of their ageing parents. Some of these families have been working for the prison system for generations. And there’s this contrast—inside the colony, the inmates lead a very cramped existence—yet outside there are these vast landscapes and hardly anyone around. Among the staff of women’s prisons, almost half are women, including the head of the colonies. They are engaged in leadership, education, training and service positions. All the convicts work as well, and mainly in the textiles industry. These places are closed so they build a hierarchy and unfortunately, there’s always a lot of violence, both from the administration as well as the prisoners. Today, according to reports from journalists and human rights activists, people are tortured in Russia’s prison system on a daily basis. So far, this year has seen the deaths of six people. Plus at least 15 people have been electrocuted, and a dozen suffocated or strangled. When you met these women in prison, how were you received? What would happen is I’d enter the prison at 8 AM and stay until asked to leave. I didn’t take any photographs for the first few weeks. We would just talk, have some tea, and get used to each other. Some of the prisoners saw a friend in me, some a sister, or a child. I was honest with them from the start. I told them I was a photographer working on a personal project. And I think these women agreed to be photographed because I told them my reasons to photograph them were almost purely selfish. I didn’t pretend my project would change their world. I confessed that it was my way of therapy. And they agreed to be a part of it. Is there a pattern in how these women ended up in prison? 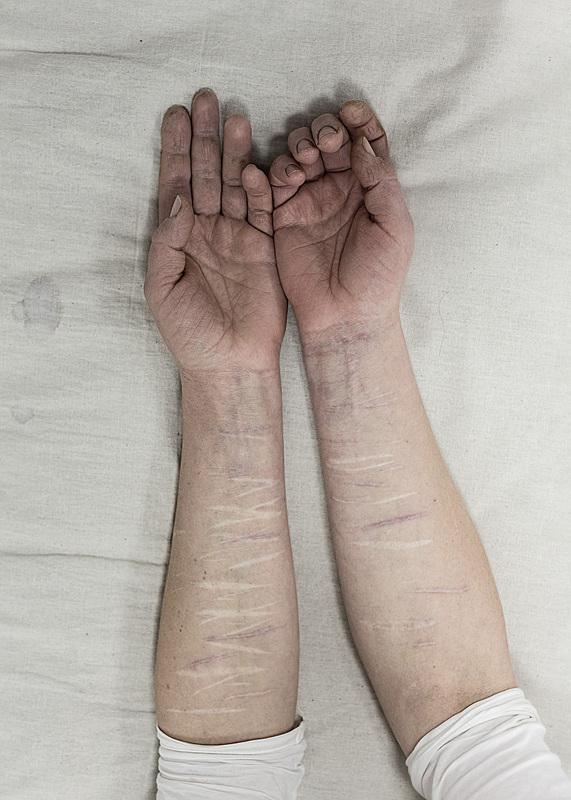 In Russia, we have a serious problem with domestic violence and violence in general. It’s not appropriate in our culture to discuss family stuff outside the house. Violence can go on for a long time until eventually the women cannot contain themselves anymore. I was shocked by one story of a grandmother who killed her daughter’s husband because he beat her daughter all the time. He also broke both of her five-year-old granddaughter’s arms. This woman does not remember how she committed the murder. My country is still a traditional one, it remains patriarchal and that’s especially visible in the countryside. We have this saying “to beat means to love.” It’s sad but we look at this point of view as acceptable. You asked some of these women to hold their favourite item in the images, what sort of things did they hold? They held lots of different things. The flowers they’ve cared for, books and things sent from home, bibles, cats, decorations. Everything is different because everyone is an individual. You visited three different types of prisons. Was there a difference in the women’s behaviour or attitudes at each different place? I visited three colonies. One was for first-time offenders, the second for repeat offenders, and the third was a settlement colony, a prison for moderate sentences, with minimum security. It is very important to separate the first-time offenders from the recidivists, because all influence each other. In the colony for repeat offenders, there were fewer hopes for the future. Many of them have empty hands on my portraits because they had nothing or they told me they were no longer interested in anything. What was your main learning from this project? What I learned is that Russia doesn’t have the infrastructure needed to support people who are released from jail. A lot of them have nowhere to go and no one to help. They face stigma and they’re labelled “criminals.” A lot of them, once they enter the system, are forced to commit subsequent crimes just because they have no means to find a job and don’t want to become a burden on their parents. I shot the series to draw attention to the fact that these women need to be rehabilitated after they’re released, and need help reintegrating into society. It would be great if our society got more information about what is going on in prisons. We lack tolerance, empathy, and awareness. What is the feeling you’ve been left with, having visited so many prisons? What I really felt was how in jail women don’t stop being mothers, sisters, teachers, loved ones, grandparents, or simply cute girls.